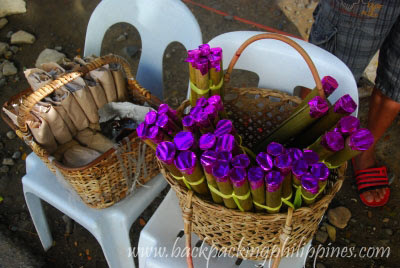 Another Ilocos delicacy, besides Candon Kalamay, peddled on the streets of Vigan is the tinubong, so called as it derives its name from the container, a bamboo tube with an opening at one end and a node at the other, which locals (Ilocano) call tubong, thus the name tinubong. 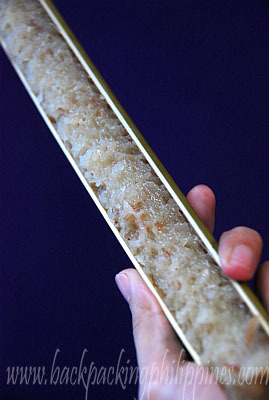 The tinubong comes stuffed inside bamboo poles of about an inch or two in diameter and about a foot in length. Tinubong is a sticky, sweet delicacy made from glutinous flour, sugar, coconut milk, small strips of buko (young coconut flesh) and sometimes cheese and margarine inserted into the bamboo tube then roasted over charcoal embers (traditionally) or in ovens (in commercial quantities). tinubong with the sweet stuff exposed when you split the bamboo tube. You can buy tinubong sold by peddlers, near the Baluarte, city plazas, and other Vigan pasalubong shops in the old heritage city for about PhP20.00 per tube depends on size and your haggling skills.